At certain times of year and in the right conditions flies can become an unpleasant problem. BPC Pest Control based in Hornchurch, Essex are experts in the extermination and control of all kinds of pest including wasps, mice and rats, pigeons and many others. Contact us today and one of our qualified technicians will be able to help you whether you’re a domestic client or large commercial client. We work regularly with several local and national lettings agents, estate agents and landlords, offering regular service contracts where suitable, throughout London and the South East. Common house flies can be 6-8mm long with a grey thorax and 4 longitudinal stripes along this. Eggs can be laid on any vegetable or animal matter providing it is not too dry and can hatch anywhere between 8 hours to 3 days. The fly larva is white and legless turning to a waxy ivory yellow in colour and more commonly known as the maggot. Pupation follows, usually taking place in the soil and this period will vary from 3 to 28 days depending on the temperature. Adult flies can exist in broods from June but are more numerous in August and September. House flies can transmit diseases when feeding on liquefiable solid food, which may be moist, purifying material or food stored for human consumption. Flies liquefy food by regurgitating digestive juices and their stomach contents onto the food substance. However, flies may also carry disease on their bodies and transfer these when in contact with other surfaces. Blue bottle flies are larger than the common house fly and they have a shiny blue body dusted with white on the abdomen. They are also known as blow flies because they ‘blow’ their eggs onto exposed meat. Creamy white eggs are laid on the flesh of dead animals and will hatch anywhere between 18 and 48 hours. The small larvae known as maggots feed on the flesh of the animal. The fly pupal stage lasts from 9-12 days, the pupa are cylindrical in shape and a dull red-brown. The normal habitat of blue bottle flies is outside. Females may enter houses in search of food. Unlike the common house fly they may frequent cool dark places such as larders and can be distinguished by their loud buzzing noise. For serious fly infestations we can provide a wide variety of targeted treatments which are low cost, effective and manufacturer guaranteed. 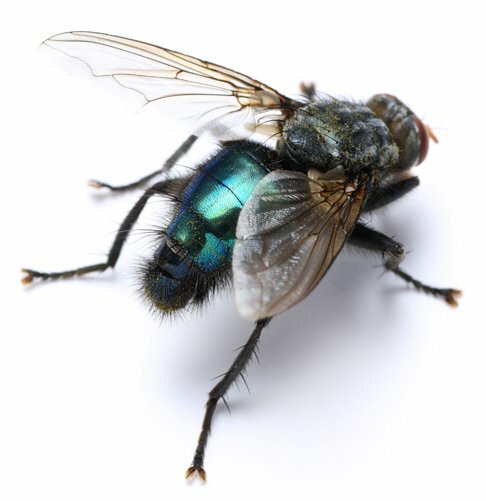 We can also offer advice on preventing a recurrence and can provide effective fly control systems including fly boxes and electric fly killers. These are particularly useful in commercial environments where food is prepared. 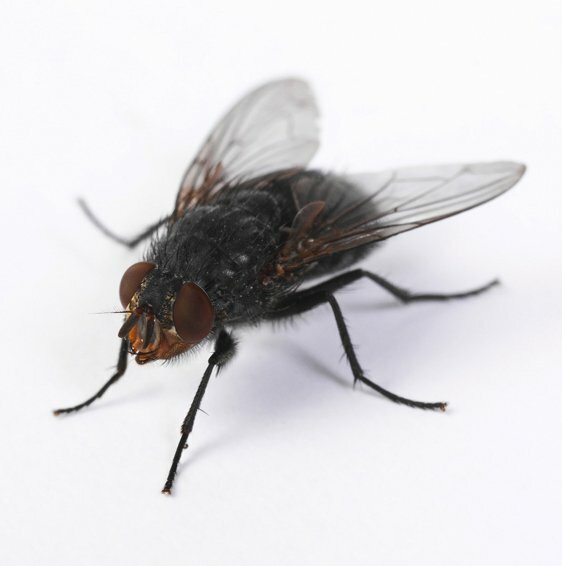 For permanent fly extermination contact BPC Pest Control.